The process of macadam line marking can be completed by our team using a range of coloured paints. 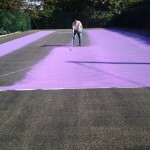 This work is done to mark out the lines for various sports including tennis, basketball and netball on outdoor courts. We will also apply a full colour coating to the whole surface, ensuring the best anti slip qualities along with a vibrant design. 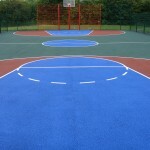 You could choose to have markings applied for one sport, or for multiple activities on a multi use games area. Find out more about costs and designs by speaking to our experienced team today. You can simply fill in the contact form and let us know what you’re looking for so we can reply back with a quote. 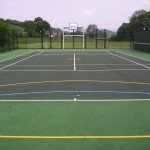 Macadam is a popular surface for a number of different sports facilities such as tennis courts, netball courts and multi use games areas where a range of sports can be played in one place. 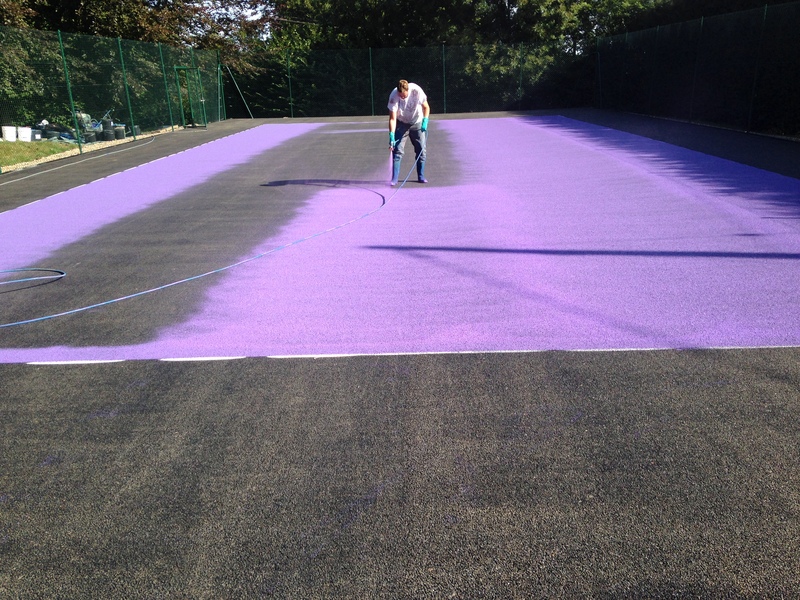 In order to achieve the multi sport qualities of a MUGA, macadam line marking in porous acrylic paint is an essential part of the overall construction process. 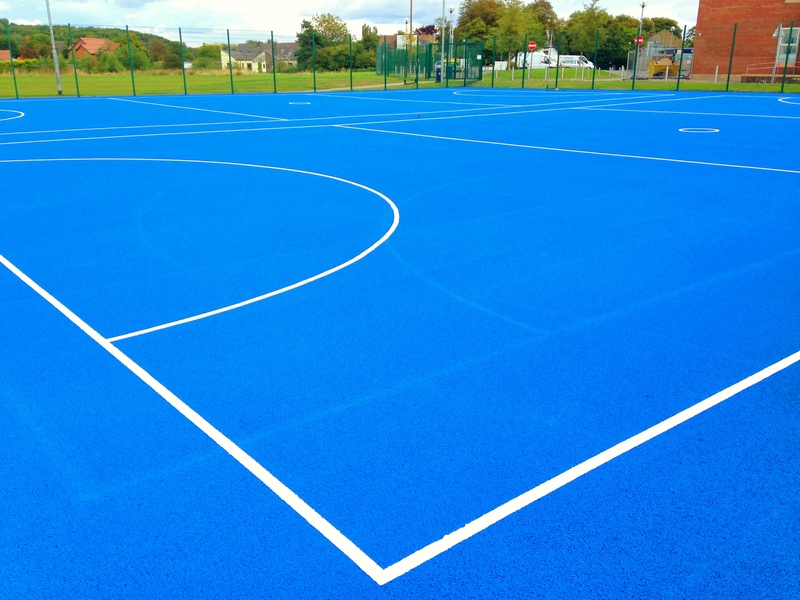 Anti slip paint can be applied to the whole hard court surface in a bright colour to improve traction and grip, then macadam line marking is applied in contrasting colours to differentiate between the different sports you want to use the surface for. 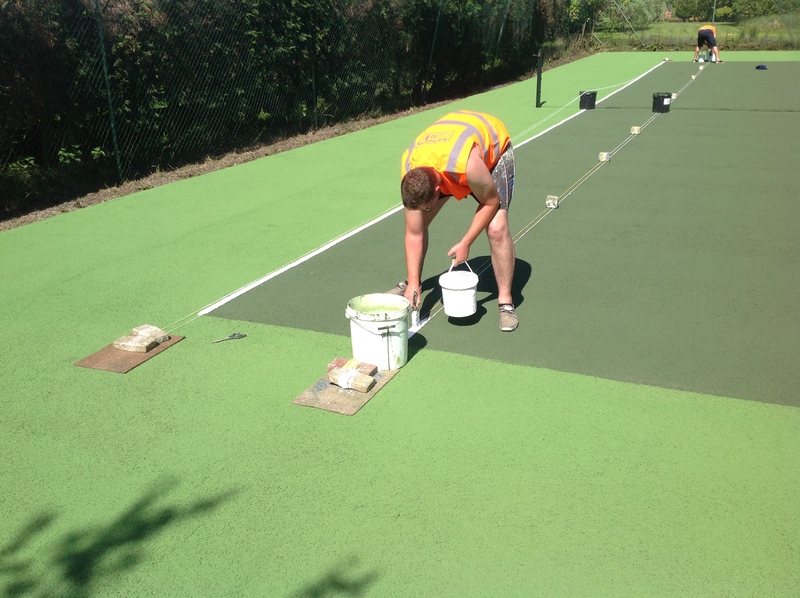 The acrylic paint used for the tarmac sports lines application can come in a range of colours including green, red, blue and green so you can personalise the sports facility to suit school or team colours. 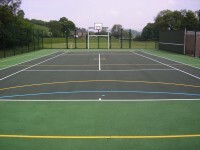 It’s important to have macadam line marking applied to your court by a professional sport surfacing contractor to ensure that the lines meet the correct sizes and dimensions for the sports you want to play; this will keep game scoring fair and accurate. Once the sports court non slip coating and surface lines have been sprayed onto the court surface, you should make sure to keep your sports facility well maintained to prevent damage and reduce the need for repainting and reline marking of the court which can be costly. 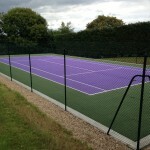 The costs for macadam court painting can vary and are usually included with the full construction and installation of a tarmac surface facility. 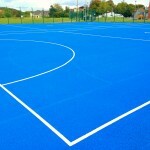 However tarmac line marking and porous acrylic paint coating prices are dependent on a number of factors including the area size of the facility, access to site and the sports which you choose to play on the surfacing. We can offer you a quote which gives you great value service at a price to fit within your budget, whether you’re a school, club, leisure centre or other organisation. It’s also vital to carry out regular cleaning and maintenance for an outdoor sports court, this could include brushing and jet washing to remove contaminants and prevent the loss of water drainage from the surface. This simple maintenance is a great investment for your organisation as it reduces the need for costly repairs and ensures the tarmac flooring has great performance qualities and is safe for everyone who uses it, whether it’s for recreational use or professional use. 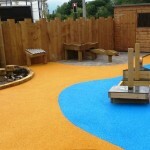 Please click here if you’d like to find out more about the tarmac surfacing specifications and design. Have a look at the video below which shows one of our recent projects involving the renovation of a tennis court surface. We carried out a thorough clean of the existing macadam area to remove the moss and algae which had built up on the surfacing. 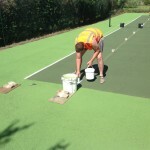 Using specialist acrylic paint we applied an anti slip coating to the court with red on the main playing area and green around the outside for the runoff. The client chose to have their line markings installed in white to create a clear and accurate game playing area for training and competitive events. We aim to give you the best products at affordable prices to make sure you’re happy with the end result and that you have a top quality sports facility to enjoy. Make sure you get in touch with us if you have a surface which needs some macadam line marking or a whole spray coating of porous acrylic paint, we can offer you cost estimates and case studies of previous work that we have carried out in the UK. Be sure to let us know the location of the project along with an area size so we can provide you with an accurate price. If you have a budget in mind please include this with your enquiry as well so we can make our costs affordable.